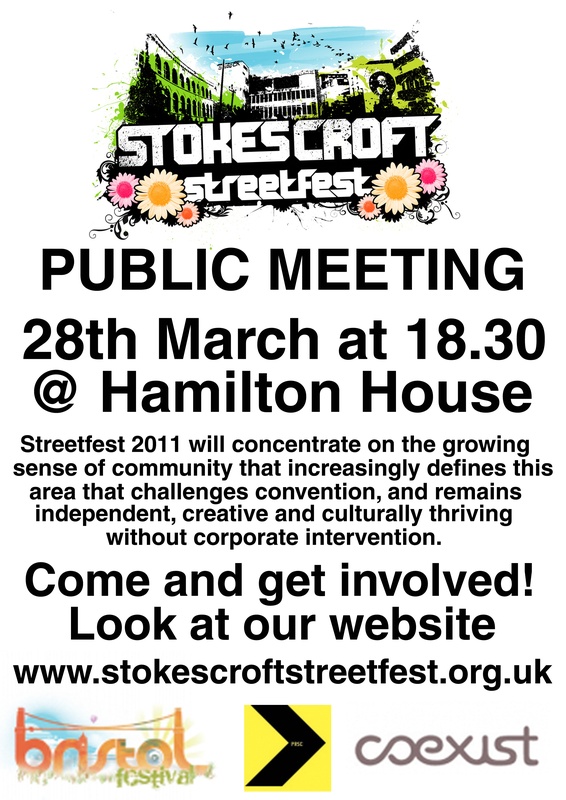 Following the incredible success of Stokes Croft Streetfest 2010, plans are under way for a new, improved Streetfest 2011. It is expected that Streetfest 2011 will concentrate on the growing sense of community that increasingly defines this area that challenges convention, and remains independent, creative and culturally thriving without corporate intervention. Likely date of the 2011 Streetfest is May 21st, subject to support from local businesses and community. Details to go live v. soon. Volunteers and participation will be central to the success of this great addition to Bristol’s festival Calendar. Below: The Bear Pit proved its potential as a venue last year by hosting live bands all day. 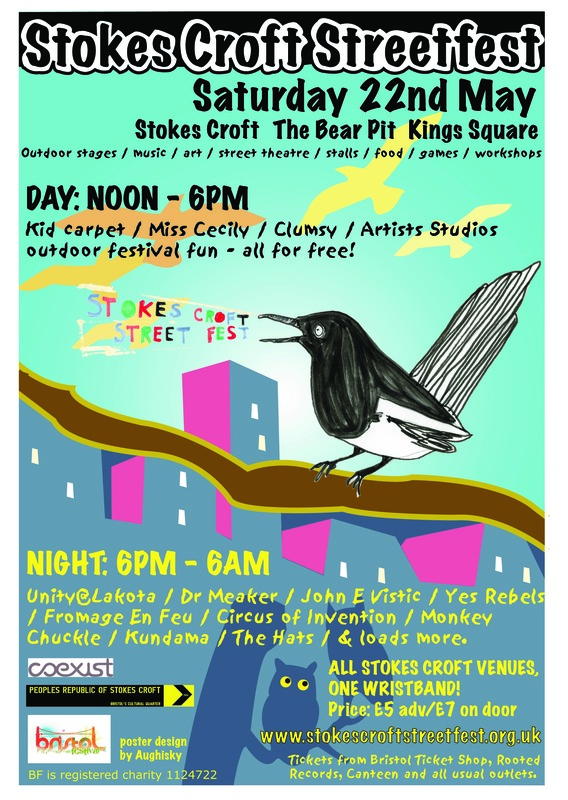 A massive thank you to everyone involved who helped to make the first ever Stokes Croft Streetfest a massive success! The beautiful weather saw swarms of happy people enjoying the entertainment and festival atmosphere, with the party continuing long into the night with every venue on the Croft buzzing with excitement. We estimate around 5,000 people attended across the day, which went without hitch or drama, so we thank the whole community for coming together to show the world what a unique and vibrant place Stokes Croft is. There were food stalls, arts and crafts, handmade jewellery, live painting, street chess, a crofts dog show, walkabout theatre, drumming, workshops, dance classes, live bands, DJs and lots of people sitting in the sunshine enjoying these spaces as destinations rather than thoroughfares . 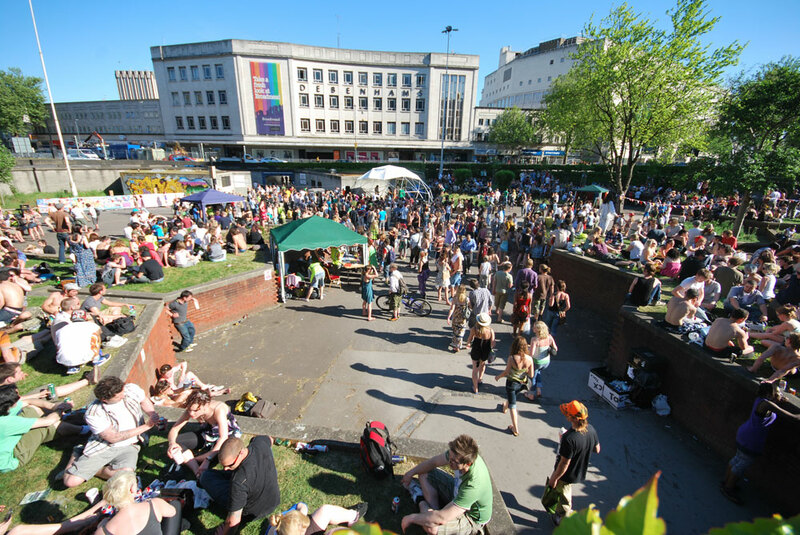 The elevated grasslands of the Bear Pit (St James Barton Roundabout) were transformed into an ideal festival amphitheatre whilst Kings Square became an oasis of family fun. It was so fantastic to see the area’s outdoor park spaces animated to their full potential, with people from all walks of life relaxing together until the sun went down. 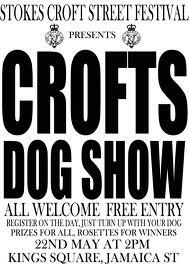 A massive amount of hard work, time and investment was put in by a handful of volunteers in order to stage the festival, working for free for months in order to create a sustainable, safe and enjoyable event that would benefit every business on the croft. So hats off to you, plus the 100+ volunteers that worked between 6 and 16 hours straight on the day – all for the cause. Without you it would not be possible. We would also like to thank the council and police for working with us and allowing us the opportunity to showcase Stokes Croft at its best. We hope to build on this success to create an annual event which involves even more of the organisations, venues and communities of the area. We are yet to calculate the funds raised but hope that all the bars and shops that benefited most from the event share their success and join in with those who have already supported, in order to secure a festival for next year. Combating the litter created from these businesses is one of our biggest challenges and we thank all the volunteers that painstakingly litter picked, Bristol City Council and Sita for their assistance, and every person who used the bins or took their litter home with them. We are pleased to say that Kings Sq and the Bear Pit were left cleaner than we found them, so thanks again to everyone who helped.